We bring to our readers' attention a creative survey of the rounds VIII-XI of Russia championship’s Superior league in Krasnoyarsk prepared by IM Ivan Smikovski. We bring to our readers' attention a creative survey of the rounds V - VII of Russia championship’s Superior league in Krasnoyarsk prepared by IM Ivan Smikovski. We bring to our readers' attention a creative survey of the first four rounds of Russia championship’s Superior league in Krasnoyarsk prepared by IM Ivan Smikovski. International master Ivan Smikovski reviews final rounds of the competition held in Sochi (Dagomys) in May. European Championship in Dresden is the event of high status and of mass participation. Several hundred games were played daily, a good deal of them by high-class chessplayers. 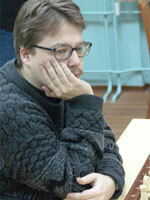 The survey of creative achievements of the international tournament "Aeroflot Open" is prepared by IM Ivan Smikovsky. Aeroflot Open is known to be the strongest Swiss system tournament in the world. The highest level of the main tournament participants, the very atmosphere of tough and uncompromising sportive struggle, when in order to get a prize one has to be in a rather big "plus",- all these factors guarantee solid ground for creative achievements and simply for interesting and instructive games. In this part of my review I intend to deal with the first part of the tournament. In 1992 in Paris a rapid chess knockout tournament with participation of the best players of the world headed by world champion Garry Kasparov took place. There were no sensations – the rating favorite won the tournament. In the first round he had narrowly won a two-game micro-match against 17-years-old Vladimir Kramnik. This was the beginning of those two players' opposition. Having been offered to write about Vladimir Kramnik's chess creative work I did not have to think long before accepting. The only thing to do was to overcome certain intellectual doubts – does the IM, even if not the weakest one, has any right to discuss merits and demerits of the reigning Champion of the World? The work itself seemed interesting and exciting to me. I sincerely hope that it will bring some positive emotions to the readers as well.